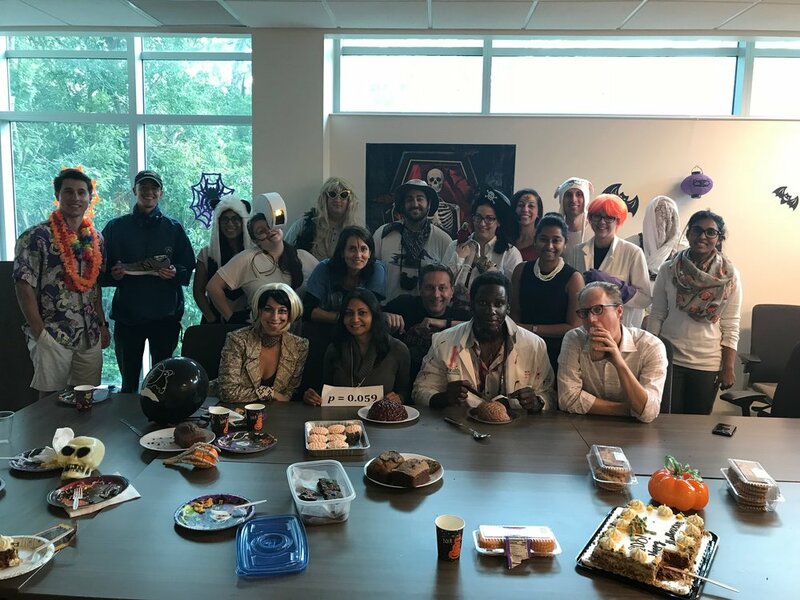 The Cognitive and Behavioral Neuroscience program celebrated Halloween with a potluck, which provided an excellent opportunity for researchers, especially those new to the department, to get to know one another. Lab members Liz Losin, Steven Anderson, Morgan Gianola, and Jenna Perry were in attendance. Can you figure out our costumes? Steven Anderson as a football coach (back row, second from left); Morgan Gianola as Brain of "Pinky and the Brain" (back row, second from right); Jenna Perry as GLaDOS (middle row, first from left); Liz Losin as Lady Gaga (front row, first from left). Costumed CBN faculty: Dr. Aaron Heller, Dr. Lucina Uddin, Dr. Roger McIntosh, Dr. Liz Losin.